It’s time for another Dishcrawl, Denver style. This time around, we’ll be exploring good eats in the Capital Hill area, starting off with City O’ City, a great eatery we’ve heard a TON of great things about, but haven’t been to yet. Starting at 7 pm, we’ll stroll around Cap Hill, lead by our fearless leader, Maggie, and hit a bunch of restaurants that are a MYSTERY until arriving at the meet up place. Check out Dishcrawl Denver to sign up for the 30th event and others coming up. If you’re vegetarian, just make sure you let them know when you sign up! Spread the word – this is a great way to get to know different communities, small businesses, and new people around Denver. Check out our other features on the last Dishcrawl and a taste of what it’s all about: Stop 1: LoHi Tavern and Stop 2:BambuCycles. Hope to see you there, friends! Healthy, scrumptious things to consume and cool bicycles are two things that Denverites go bananas over; it’s not hard to see why Denver, Boulder, and the Loveland areas made top 10 on a recent study’s slimmest cities! Check out this local business that’s helping us reach such lofty fitness goals – Stop #2 on the March 2014 Denver Dishcrawl, BambuCycles. Using a masticating juicer (that means no blades, my friends) the fruits and veggies juiced by the guys at BambuCycles leave nearly all of the vitamins and nutrients in tact, extracting all of the pulp and fiber; the process uses a slower, crushing and squeezing method than other commonplace juicers. Another cool fact: BambuCycles in LoHi succeeds at extracting about 90% juice instead of the typical juicer’s 60% return. They make our Jack LaLanne juicer look like a joke! Check out the differences between masticating (more expensive) and centrifugal (more common, less expensive) juicers here for an easy run-down on the two. The guys at BambuCycles juiced two, glorious samples for us- one green, and one made of fruits including pineapple, cantaloupe, and watermelon. Ever wondered about how juicing works, or wanted to take advantage of the many health benefits juicing provides? Stop in and chat with Angel and the guys; not only a wealth of knowledge, the staff are happy to assist you with customized juice orders, detoxes, and cleanses. Some of the fruit was saved from juicing and chopped into small salads with a spicy twist (pictured above). Take your favorite melons (cantaloupe, watermelon, etc), and chop into 1” chunks – we like to fill a standard dinner-bowl full of the fruit to split between two people. Drizzle lemon juice (to taste). We prefer a TON of lemon juice simply because the tangy and sweet combination of the lemon juice and the fruit is incredible. Mix the fruit, lemon juice, salt, and cayenne / chili pepper together, making sure each piece of fruit gets this crazy combination of ingredients for the best variety of flavors in every bite. Seriously, it’s like a party in your mouth. Check out The Food Renegade for more great info on Kombucha. BambuCycles offer a stylish ride that stands out in a crowd. Not only are they cool looking, but they also provide natural shock absorption that simply can’t be replicated by other machined bikes. Stop in and check out these sweet rides! 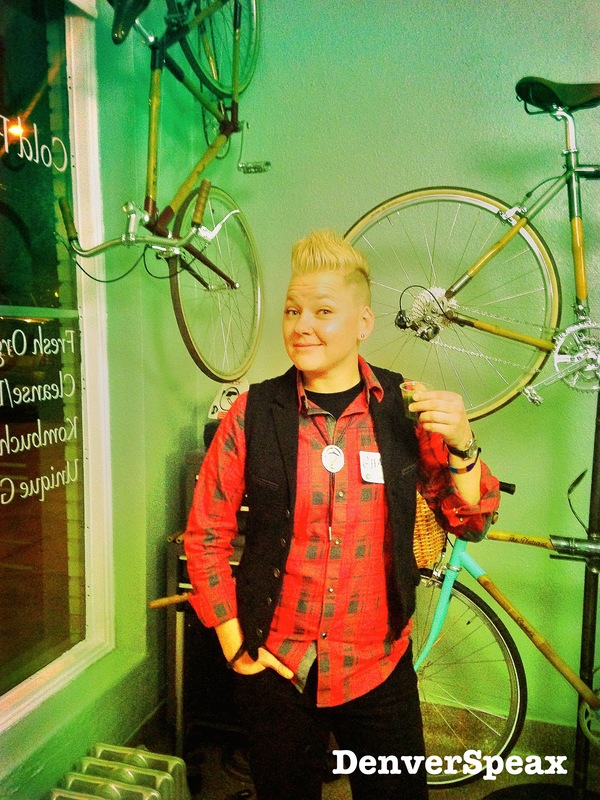 Alright, alright… juicing, healthy & delicious snacks, Kombucha, AND bamboo bikes? Does BambuCycles NOT do anything awesome? The answer is obviously no. 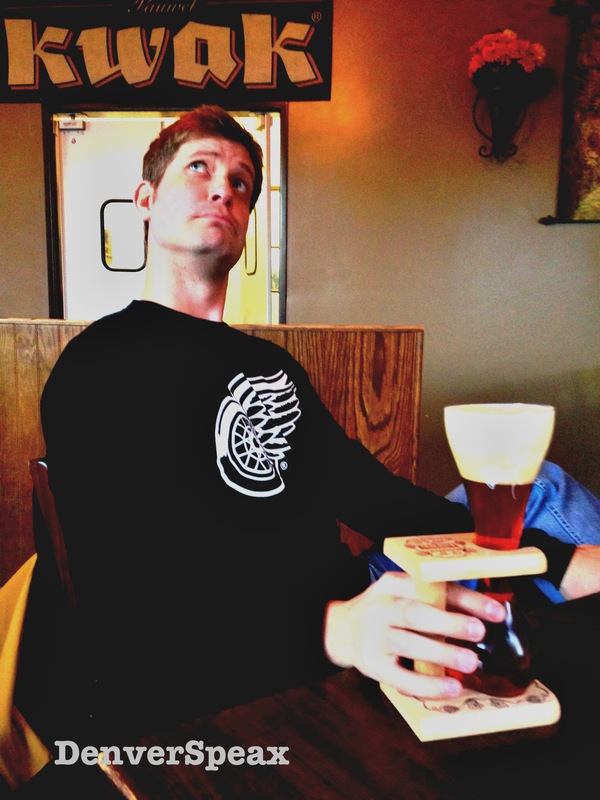 They offer some serious benefits to the LoHi community, and definitely have a blast doing it. We look forward to stopping in again soon and learning more about their interesting business. 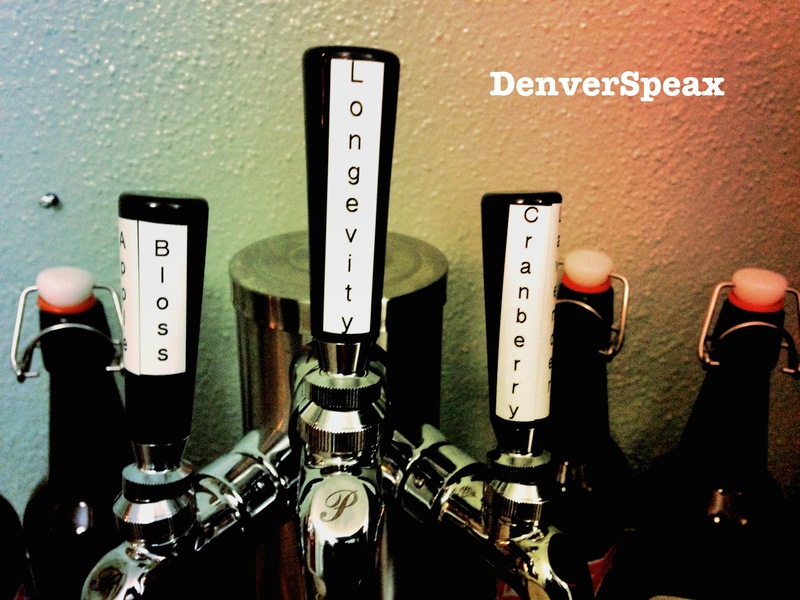 Welcome to Colorado Craft Beer Week, going on March 21 – 29, 2014. Check out the calendar and participate in events all around Colorado at favorite breweries, pubs, and restaurants. Don’t see your favorite brewery, pub, or restaurant on the event page? Check their websites or Facebook pages! Odds are, they’re planning something for you, your family, and friends to enjoy for Craft Beer Week! Tell us your favorite breweries and why – help us out with new places to visit. We have a Michigander coming into town this weekend, and would love to enjoy a new experience alongside him! A gathering place, LoHi Steak Bar is centrally located on 32nd Ave & Tejon St. – right in the middle of all the LoHi (Lower Highlands Denver, for you newbies) action. With an easy locale, a welcoming atmosphere, and a killer restaurant and bar menu, it’s easy to see why LoHi Steak Bar is an easy choice in LoHi. The first stop on our Denver Dishcrawl, LoHi Steak Bar, accommodated our vast group in a private dining area. With name tags on our shirts signaling vegetarian or otherwise, dishes composed of their specialties were placed before us. On other organized “crawls”, it’s not uncommon to receive a dish or two crammed onto one, crowded plate; it’s also not uncommon to receive a well-versed speech regarding said crowded dish from some trainee who barely knows the joint. LoHi sent out their best dishes and friendly, intelligent staff to go over the SEVERAL dishes they created and disbursed. 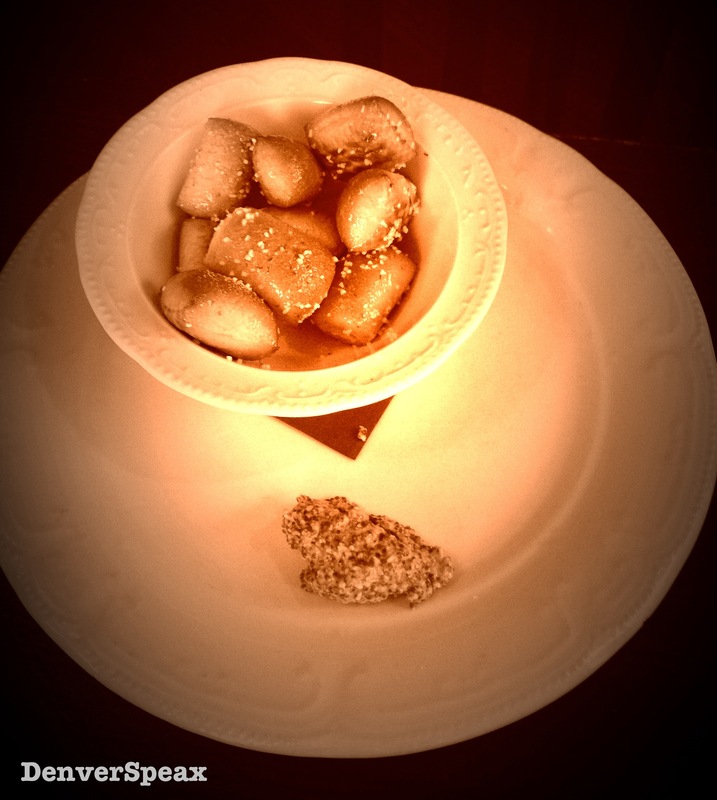 Details of local ingredients and other facts of each dish were provided in advance of each plate devouring. First, we were provided button mushrooms stuffed with Polidori Sausage (a local Colorado company!). Lemon was provided to be squeezed over the mushrooms, adding an incredibly tangy flavor to the hearty plate. Well done, LoHi… well done. Also pictured is a fantastic Moscow Mule in the proper, copper mug. 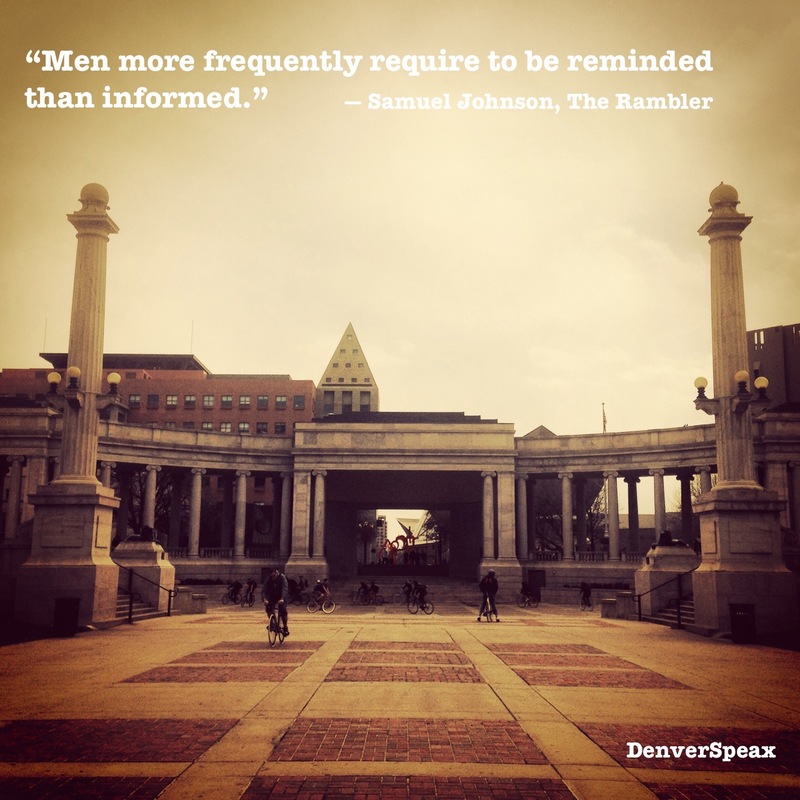 Just a friendly, DenverSpeax reminder – if it doesn’t come in a copper mug, it’s not real. Write that down. Next, we’re presented with “not your average” Hummus Plate – LoHi uses fresh ingredients to concoct a thick, creamy Hummus with olives and red pepper. DenverSpeax feels there’s a fine art in creating your own house Hummus, especially when it tastes as great as their’s (and when you’ve tried countless times at home, each ending in failure…)! Great starter for your table of friends. Here we go – the pride and joy of Stop #1 at LoHi Steak Bar – the vegetarian Portobello Sandwich (made especially for the Dishcrawl) and the House Ground Chuck Hamburger. Both were exceptionally prepared: juicy, fully dressed, and flavorful. There wasn’t the slightest hint of stuffy or dull – just two classics that delivered nothing short of satisfaction. Oh! 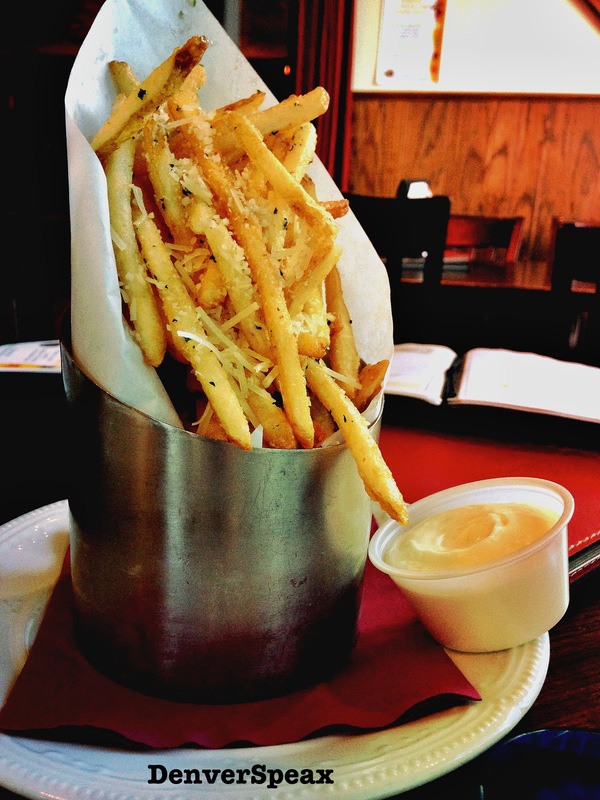 Their seasoned, crispy House Frites were fantastic as well, and served as a welcomed and complimenting, over-indulgent side. As if all of this weren’t enough, LoHi went ahead and dished out creamy, delicious Cheesecake as well! Sorry, this went too fast for the camera to keep up – our sincere apologies. Please keep in mind that this was only Stop #1 of 4 on the Denver Dishcrawl, folks. We understand that at this time you must REALLY be kicking yourself for not attending. 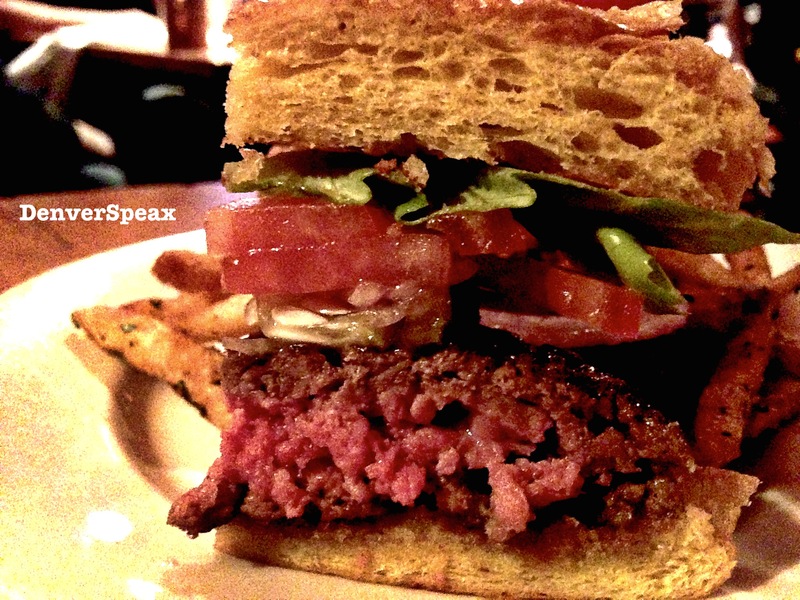 We get it, and luckily there are more Dishcrawls coming up in Denver. Make sure you stop by the Dishcrawl site to check out the next events, and secure you & your friends’ spots. Even though we’re only one stop in to this magical, dish crawl blogging journey, I’m sure you’re understanding the great value and experience Dishcrawl.com is prepared to provide us all. 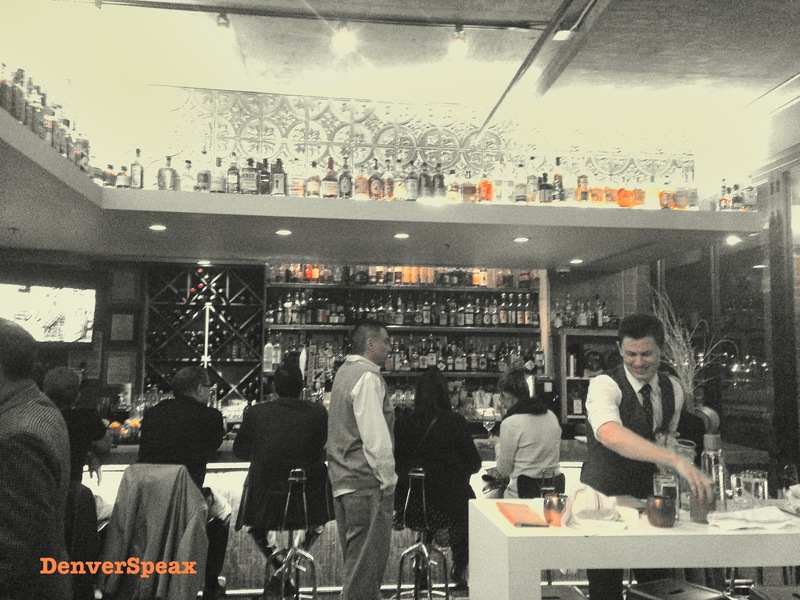 Not only does Dishcrawl bring us together within our beloved Denver community, it introduces us to great gathering spots, like LoHi Steak Bar. I think Maggie said it best when describing our first stop as a “non-stuffy” place; we agree that LoHi Steak Bar is perfect for relaxing and hanging out with those who mean the most. Check out their events, specials, and menus on their site. Also, make sure you invite us to your food fest – it hasn’t even been a week, but we’re ready for more mushrooms, burgers, and frites! 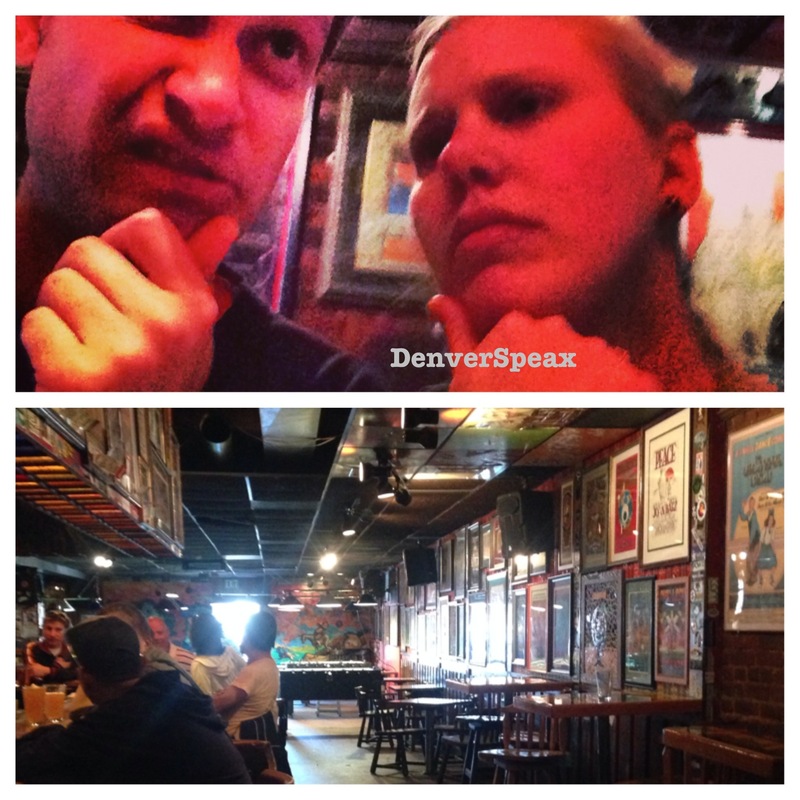 Last Wednesday, Annelise and I (Kirsten) went on a foodie adventure via Dishcrawl Denver. We visited four, happening spots that each displayed the true meaning of communal and friendly gathering, while also providing a flexible and fun environment to try their specialty dishes. Let’s be honest – it was a foodie’s paradise. From portobello sandwiches to salted, oreo ice cream – we indulged in much of what LoHi has to offer in the arena of “good eats”… in only a few hours’ time. We also got to meet a ton of new friends from various industries, all calling themselves “foodies” as well! Food + New Friends = Can’t Go Wrong. Maggie, our Dishcrawl ambassador, did a fantastic job of highlighting not only the specialties, but also the contributions to the community of each stop. We mowwed down on meat and vegetarian dishes alike, and are proud to bring you the low down on all that is good in LoHi in these next few features. 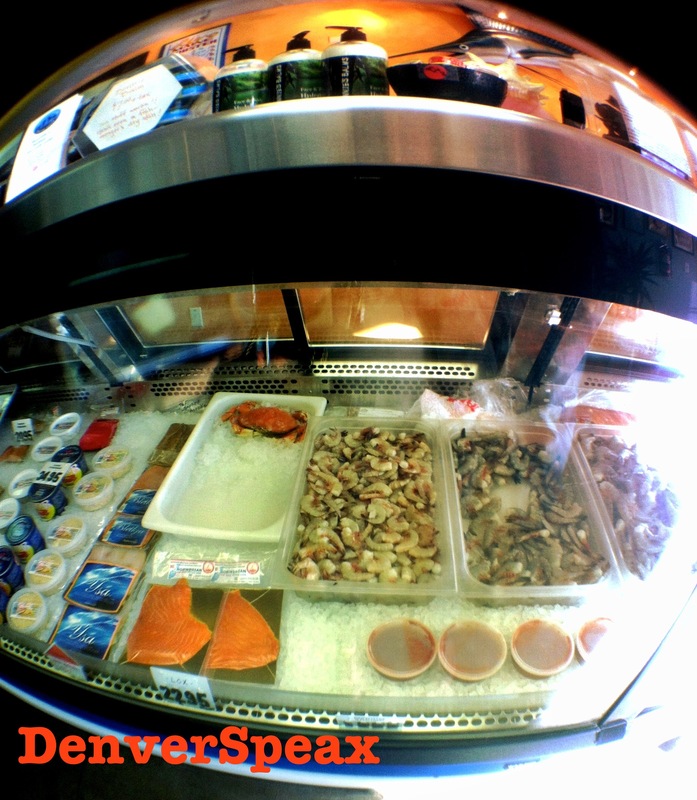 Stay tuned for our upcoming, exclusive features on each stop of the Denver Dishcrawl in LoHi. Not only did we find new mouth-watering eats, but also small businesses that are strengthening our Denver community in very unique way. Make sure you check out Dishcrawl and pencil in the Denver dates on your calendar. With the combination of great food, fun, and new friends, it’s just silly not to be there. With the nice weather coming, we feel it’s important to create fun and safe Bicycle Pub Crawls. Yesterday, Jeff and I (Kirsten) set out to visit a few pubs on Colfax, and ended up riding 7 miles round trip while visiting. Check out the highlights of our three stops! We’ve been hooked on this Football (or, soccer) pub since last summer when we experienced a bus trip from the place to see The Colorado Rapids. Three Lions is all things Football, have a variety of great beers, and some killer appetizers. Bonus, their patio out front sports a few fantastic picnic tables so you can enjoy the sun and your brew simultaneously! Sancho’s is another place we really enjoy – who can’t with all of the Grateful Dead parafanalia, pool tables, and ridiculous specials. 2 for $3 Coors Light drafts yesterday? Don’t mind if we do! We also made a friend from Wisconsin who had stopped in before going to finish up some errands. There are always friendly people at Sancho’s with interesting stories to tell. Stop in and say hi. Yesterday was my first time at the Cheeky Monk. Jeff introduced me to a Belgian Strong Pale Ale, Pauwel Kwak. A heavily fruity beer, there was a brief banana after-taste – something new! Try it out – it gets great ratings, and is served all fancy-like. In addition to the Kwak, we also had some tasty frites (fries) served with a garlic aioli as well as delicious pretzel bites served with a spicy mustard. Specific appetizers were half off while we visited – check out the Cheeky Monk online to see when they host happy hour and other specials. 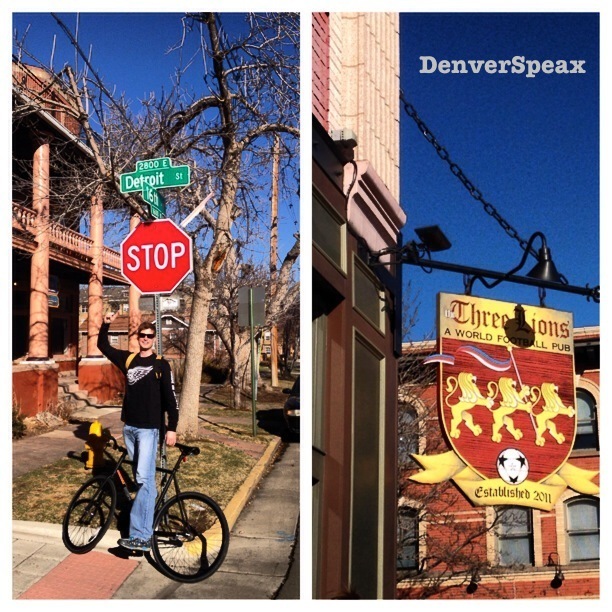 There you have it – a mini pub crawl on Colfax Ave with 3 great locations. We look forward to planning more of these epic excursions to explore more brews and good eats around the city. Where should we go next? Let us know in the comments below, or on our Facebook page! Remember a few months back when we explored The Highlands and visited places like Vert Beauty & The Matador? 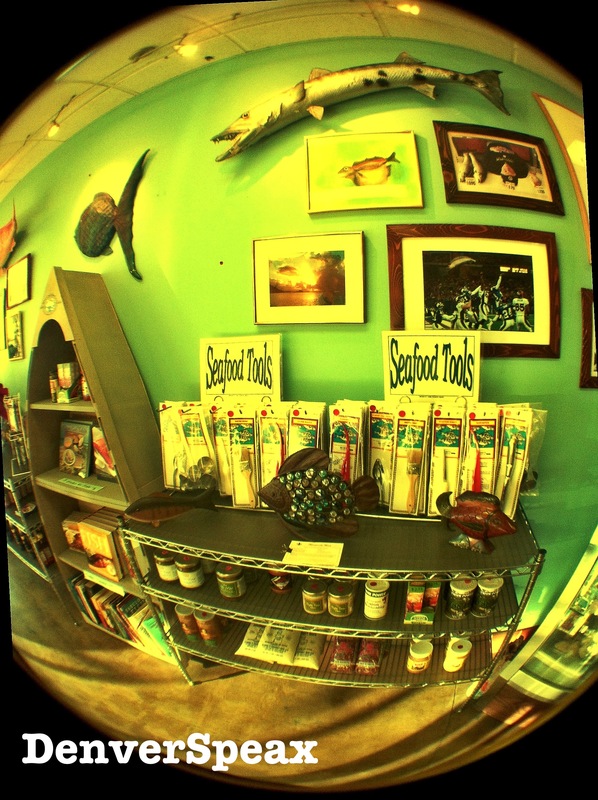 We also visited this fantastic seafood shop located at 3457 W. 32nd Ave called Seafood Landing. Open since 1974, the staff over at Seafood Landing really know their stuff, and carry an incredible selection. With the help of Seafood Landing, we can now make a May 2014 Crawfish Boil actually happen right here in DENVER! When speaking with the staff, we learned that the original owners of Seafood Landing actually brought seafood to Colorado about 25 years ago – we’d say that’s quite the incredible feat, and deserves to be recognized. Seafood Landing not only sells a great variety, they also have spices, cookbooks, and other novelties to help you do it right – this is definitely a plus! Not sure what spice or recipe to follow for your purchase? Ask them! They’re happy to help make your experience enjoyable in any way possible. The Omega-3 found in fish oil is fantastic for your health! Looking to lower blood pressure and help out your heart? Fish! Trying to figure out a way to burn fat faster? Pick a day or two of the week and eat fish instead of red meat as your protein. The benefits are plenty – good thing we have Seafood Landing to help us out! Stop in and say hi – check them out and support local business that supports your health. We love when people like us on Facebook! Also, when friends like to “follow us” on Twitter.